On 24 May our junior team took part in RG Tournament in Jurmala with their group routine ( 5 balls). Video/ Group routine/ 5 balls (25. 65 points). On 26 April, 2014 our gymnasts took part in the International RG Tournament "RVS Riga 2014". On 21 December we participated in Christmas tournament held in Jurmala. On 16 December, 2013 Christmas tournament was held in Riga "Ziemassvētku turnīrs". On November 3, 2013 our gymnasts participated in RG tournament "Vingro Visi", in Riga. Regina Mandrik ( born 2002 ) performed her clubs routine and her rope routine. Veronika Nesterova, Ksenia Lapina, Elizaveta Surovegina and Polina Kireeva - all born in 2001- performed their clubs routines and ball routines. Veronika Nesterova won 2nd place. Our congratulations to Veronika! Ксения Лапина заняла 1-е место ( 17, 400 баллов), Маргарита Филиппова - 3 место ( 15, 700 баллоa). Екатерина Елизарова также заняла 1 место ( 14, 600 баллов), Регина Мандрик - 5 место ( 11, 700). On 27-28 April, 2013 our gymnasts born in 2001 and 2002 took part in "RVS Riga Cup". On 13-14 April, 2013 our team participated in RG International tournament " Baltic Hoop 2013" held in Riga. Our gymnasts - Veronika Nesterova, Еlizaveta Surovegina, Кsenia Lapina, Polina Kireeva, Margarita Filipova - performed their group routine (5 balls). The girls won 1st place with the result 25, 517 points. Congratulations to our coaches and gymnasts! 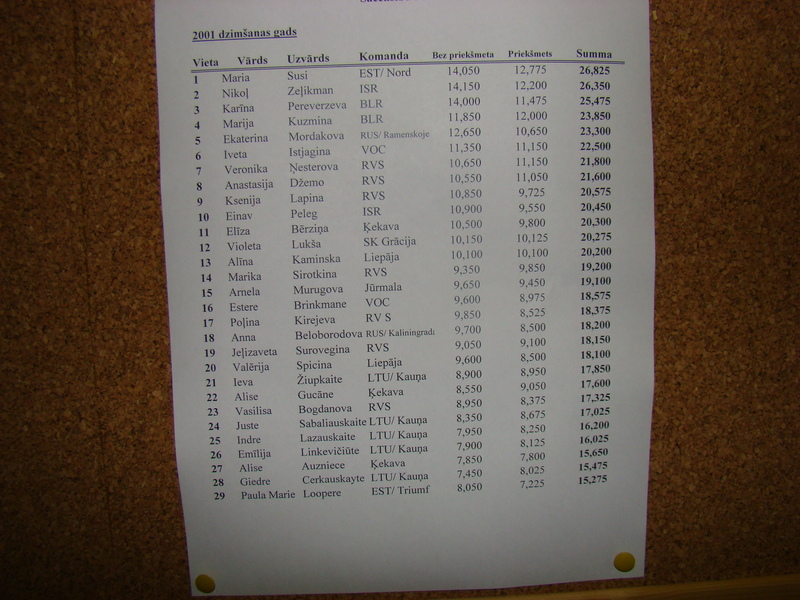 On 23 March, 2013 Latvia RG Championship was held in Liepaya. Two our teams competed with their group routines. On 8 December our team participated in "Anna Melody Joulutirniir 2012", RG tournament held in Tallinn, Estonia. Gymnasts born in 2001 performed with hoops and clubs, gymnasts born in 2002 competed with hoop and rope routines. On 2- 3 December, 2012 International tournament "Olympic Cup 2012" was held in Riga . Veronika Nesterova, Кsenia Lapina and Elizaveta Surovegina also competed with their individual routines. On 24-25 November Latvia Championship was held in Riga. Within the tournament group competitions took place on 25 November. Two our team competed with the group routines. On 27-28 October " Vingro visi"open tournament was held in Riga. On 27 October gymnasts competed with their group routines. On 28 October our gymnasts born in 2001 competed with their individual routines - hoop and clubs. On 23-26 August the international tournament "Mazā un lielā grācija" took place in Jurmala. On 23 August Latvian gymnasts competed in the tournament. Katya Elizarova, Veronika Nesterova, Карrina Luksha. On 28-29 April, 2012 our team participated in "RVS Riga Cup" international RG tournamentin held in Riga. On 22nd April, 2012, two our teams competed in Latvia Championship perfoming group routines ( IV sports category, 5 balls). Our gymnasts took the 3rd and 5th place. IV sports category - Regina Mandrik, Ekaterina Elizarova, Victoria Tkacheva, Ksenia Lapina, Elizaveta Surovegina, Margarita Filipova. V sports category - Polina Kireyeva, Veronika Nesterova. On 17-18 March 2012 Open Championship of Jurmala was held. Two of our gymnasts took part in the competition - Vera Chilia and Aurika Filippova. On 18-19 February 2012 we participated in Riga Youth RG Championship. Having performed their group routine ( " 5 hoops" ) our gymnasts ( 3rd sports category) won the 2nd place . Results. On 17 December "Ziemassvētku turnīrs" ( Christmas Tournament) was held in Jurmala (Latvia). On 11 December we took part in the tournament "Ziemassvētku prieki 2011". Our gymnasts performed their group routines ("5 hoops "). On 25-27 November our team participated in the 6th International RG tournament "Karpathia 2011" which took place in Uzhgorod, Ukraine. On the first day, on 25 November, the gymnasts performed their group routine and the first routine of their choice. On 26 November we performed the second group routine ("5 hoops"), as well as the second individual routine. Our team took the 3rd place in the group routine without apparatus and the 2nd place in thegroup routine "5 hoops". On 27 there was final based on the results of the two previous days. Our team was represented by Veronika Nesterova and Ksenia Lapina who got right to compete in the final and perform their ball -routine. Ksenia took the 5th place and Veronika - the 7th place. We performed both individual and group routines ( 5 hoops). Our team took 5th place in the group routine. On 08-09 October we participated in the International tournament "Rudens 2011" in Riga. On 08 October our gymnasts took part in the individual competition and on 09 October - in the group competition (5 hoops). On the first day of the competition, on 25 August, gymnasts from Latvia competed for the right to took part in the international stage of the tournament. On 27-28 August Veronika Nesterova competed in the international stage of the tournament and took the 5th place in the rope routine and the 4th place in the hoop routine. On 28 - 29 May - Jurmala Open Championship. On 09 - 10 April, 2011 - international tournament " Espinho 2011" ( Portugal). Our team was represented by Veronika Nesterova and Jelizaveta Surovegina. without apparatus - 1st place, hoop routine - 1st place, ball routine - 1st place, all-around - 1st place. without apparatus - 3rd place, hoop routine - 3rd place, ball routine - 2nd place, all-around - 2nd place. On 19th December we competed in the tournament " Ziemassvētku turnīrs" in Riga. On 11th December we participated in the Christmas competition " Ziemassvētku turnīrs" in Jurmala.